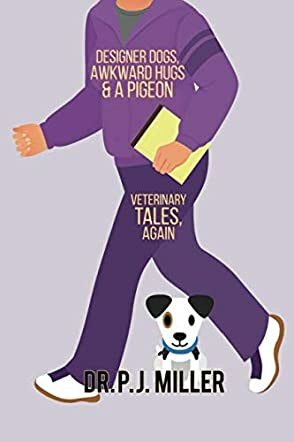 Designer Dogs, Awkward Hugs, and a Pigeon: Veterinary Tales, Again is a non-fiction memoir written by PJ Miller on his experiences as a veterinarian working with animals for a living. The story starts off humorously and sets the tone for the rest of the book. PJ Miller talks briefly about his previous book and how this one can be considered a sequel, although it can also be read independently. This book details experiences from his veterinary practice which include some of his long-time customers and animals and the bond they have formed with the practice group, with the ups and downs in the lives of these patients. The book is divided into several chapters and, along with describing his daily experiences as a professional, there are also a lot of anecdotes between the staff and the doctor which make for fun and amusing reading. Although the overall theme of PJ Miller's book is essentially that of experiences with animals, especially pets, I found the parts with the office staff and their shared camaraderie to be equally interesting. This is mainly because of the funny and humorous writing of PJ Miller that almost makes the practice staff feel like one family rather than co-workers. Although perhaps some of the repartee may be exaggerated, still, the witty and engaging writing style makes this a thoroughly entertaining read. I also enjoyed reading about the different animals and their unique personalities through the eyes of a veterinarian. Even better than the first one ! Loved it.